Indoor Air Pollution (IAP) describes the adverse ambient air conditions inside households, schools, places of work and other indoor spaces. This can be caused by a range of sources, including stoves, smoking and machinery. Most IAP occurs in the developing world. The most significant cause of indoor air pollution in the developing world is the burning of coal or unprocessed biomass fuels for cooking, heating and light. More than 50% of the world’s population gets their energy for cooking in this way. Almost all of these people live in poor countries. Biomass fuels are typically burned in rudimentary stoves. Importantly, few of these fully combust the fuel, therefore resulting in inefficient use of precious fuel and unnecessarily large air emissions.3 The high amount of emitted particulate coupled with usually poor ventilation produces indoor concentrations of toxic fumes which are a very real health risk to families. Those most affected are women, who do most of the cooking, as well as infants, who are often times strapped to the backs of their mothers. The US EPA recommends exposure standards based on a 24 hour average. In this time frame, it is recommended that average concentrations of PM10 should not exceed 150 ug/m3. In homes that cook with biomass fuels, concentrations are typically in the range of 300 to 3000 ug/m3, or up to 20 times higher than recommended levels. At times of cooking this number can reach as high 30,000 ug/m3 or 200 times the recommended level. Because Indoor Air Pollution is so widespread, Blacksmith receives few nominations for specific sites. Biomass fuel use strongly correlates with per capita income, as this is what inhibit or encourages the transition to cleaner fuels and stoves. Therefore the area most worth highlighting here is Sub Saharan Africa, where per capita incomes remain lowest. Hundreds of campaigns have been implemented around the world to end the threat posed by IAP. Most of these have focused on the introduction of more fuel efficient stoves. However, these efforts need to be complemented by more comprehensive approaches to include improved ventilation, lifestyle changes, and host of other interventions ultimately resulting in a transition to cleaner burning fuels. 1 Smith, K.R. “Indoor air pollution in developing countries: recommendations for research.” Indoor Air 2002: 12: 198-207. 6 Smith, K.R. “Indoor air pollution in developing countries: recommendations for research.” Indoor Air 2002: 12: 198-207. 9 Smith, Kirk R. “National burden of disease in India from indoor air pollution” PNAS. November 2000. Vol 97. No. 24: 13286-13293. 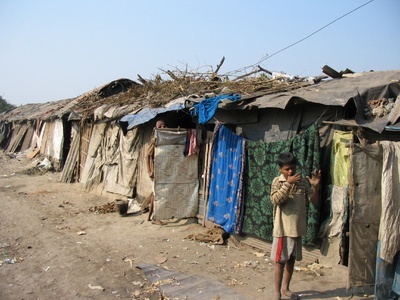 Indoor Air Pollution is a widespread problem in poor communite like this one worldwide. Kolkata, India. Photo by Blacksmith Institute. Preparing meals in poorly ventilated spaces. Latin America. Photo by Blacksmith Institute.